As I promised in my previous post, I am sharing the other recipe with you. 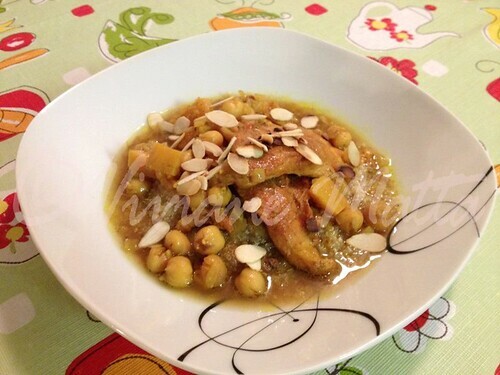 Actually this is a dish I have made before when I still was in Lebanon and I found myself craving it a couple of weeks ago. Yeah it is this good! On the first time making it, I replaced the butternut squash with potatoes since I had none. This time, we forgot to pick up some couscous from the store, so we had to find an alternative. After consulting with Clint for a few minutes he suggested quinoa. I had bulgur or rice in mind, but I thought it could be a great opportunity for me to try quinoa, on all levels. I have never tasted it before, so you can tell I never cooked it either. So quinoa it was. Since I have posted an info page about Moghrabieh, I noticed that it arose a lot of interest. And since then I have been meaning to post a recipe, but you know my story with taking recipes from my mom. 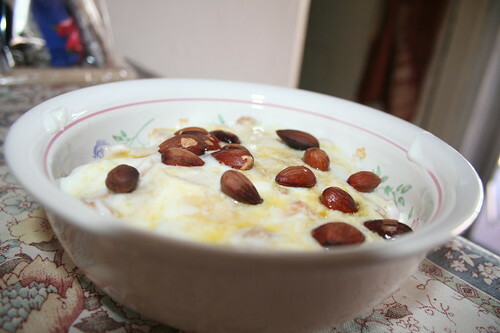 And I wanted her recipe in particular, because Moghrabieh comes out perfect with her. I was really looking forward to making the Lebanese Falafel over the weekend! I have heard about the dish quite a bit, but I had never really tried it, let alone made it. I had some free time to make a lunch on Friday and so I decided to do the challenge! 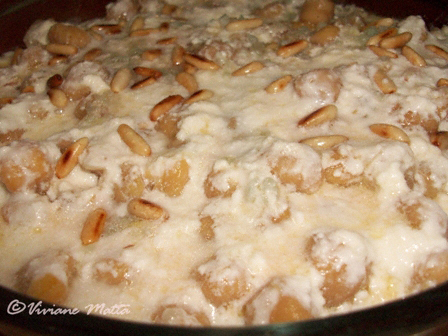 Today I made the Chickpeas Fatteh, which I had heard is one of Viviane’s favorite authentic Lebanese dishes. In beginning this adventure, I must have checked 6 or 7 different stores for something close to Lebanese bread and to no avail. 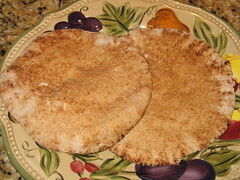 I found some “Middle Eastern Flat Bread” at Trader Joe’s, but this ended up not fitting the bill so after reaching my limit of frustration, I decided to go ahead with some pita bread. The rest of the ingredients were easy to come by in the average US supermarket. I have to begin by saying WOW! What a recipe! I was excited to try a real Lebanese recipe and I was not disappointed! There has been a heat wave in Cape Town this week and it’s been too hot to want to cook anything. So when Viviane posted this challenge, I thought it’s perfect for lunch, especially in the heat and doesn’t require too much work. I went to the store to buy the ingredients needed, and to my disappointment could not find pine nuts. I suppose not a commonly found nut in stores here. Since I had read Viviane’s post before going to the store, I knew that almonds would work, so I bought a packet. 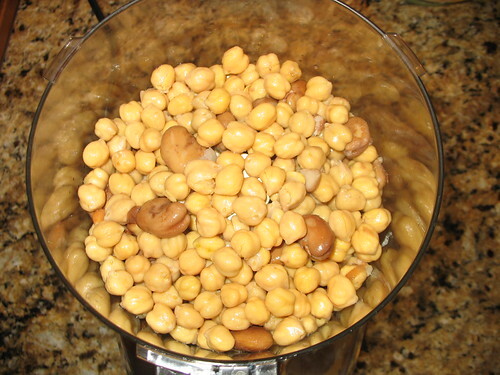 I also did not manage to get fresh chickpeas, so I was forced to go with canned. For the bread, I bought pita. I got home and set to preparing it immediately. I followed the recipe, only substituting red wine vinegar for brown spirit vinegar. I did not follow the amounts since after talking to Viviane, she said it would not be good as leftovers. I was alone at home so made enough for myself only. 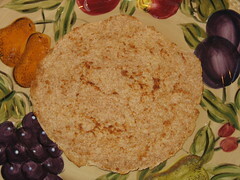 I toasted the pita in the toaster, roasted the nuts in the microwave and quickly sautéed the butter, garlic and vinegar mixture. I also used some salt in the yogurt since I was unable to find Greek yogurt in a small tub (which I love) and had to go with Bulgarian. I broke the bread up in bite sized bits and layered according to the recipe. I don’t know where this soup originated from, but I know it was cooked at my aunt’s household. 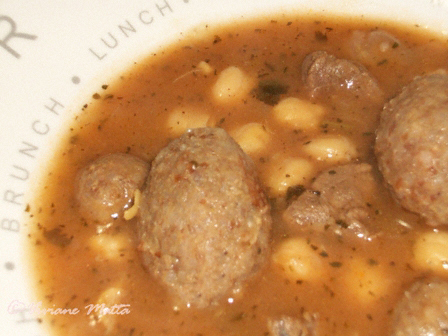 My uncle was Armenian and his sister cooked this soup, so we named it after her: Zaza’s Soup. 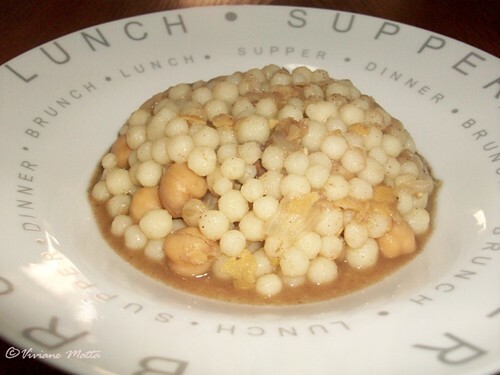 Maybe the soup is a mix of Armenian and Lebanese, even though the event is for Lebanese cooking, I think this soup characterizes the spirit of Lebanon and its diversity. Not to mention it is a delicious soup that I hope those who will try will enjoy.